Elizabeth II is Queen, Tony Blair is Prime Minister and Britain is a member of the European Union. The digital revolution is gaining momentum; televisions, computers, mobile phones are commonplace, you are almost a freak if you don't have a car, central heating and at least one bathroom. In Willen the birdsong is all but drowned out by the constant drone of motor vehicles on the M1 motorway and network of highways that define the new town of Milton Keynes. There is virtually no agricultural land left in Willen. The hamlet is surrounded by new housing, industrial units and the city sewage works. 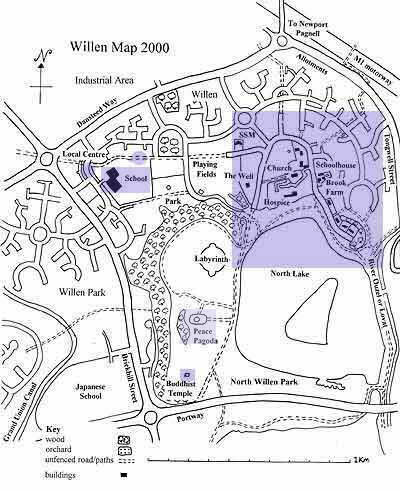 However, the dominant feature of the village is the presence of a lake and public park in place of the pastures to the south of the village. It is a place of beauty and tranquillity to bird watchers, dog walkers and fishermen alike.